Supreme Court of India on Tuesday issued directions to prevent the misuse of provisions of Scheduled Castes and the Scheduled Tribes (Prevention of Atrocities) Act 1989 (SC/ST Act). A Two Judge Bench of Justices AK Goel and UU Lalit was examining the question whether there can be procedural safeguards so that provisions of Scheduled Castes and the Scheduled Tribes (Prevention of Atrocities) (SC/ST) Act 1989 are not abused for extraneous considerations. Imparting a ‘symbolic justice’ to millions of construction workers in the country, the Supreme Court gave certain directives with regard to implementation of the Building and Other Construction Workers (Regulation of Employment and Conditions of Service) Act, 1996 (the BOCW Act) and the Building and Other Construction Workers‘ Welfare Cess Act, 1996 (the Cess Act). The Supreme Court, on Monday, held that while recovering secured property from Non-Performing Assets (NPAs), a secured creditor should mandatorily consider the debtor’s representation under Section 13 (3A), after the initiation of proceedings under Section 13 of the Securitization and Reconstruction of Financial Assets and Enforcement of Security Interest Act, 2002. The Supreme Court, in P Sreekumar v State of Kerala, held that there is no prohibition in law to file a second FIR in relation to the same incident, if it was not filed by the same person, who had filed the first FIR, as a counter-complaint, based on the allegations different from the allegations made in the first FIR. In a huge relief to a retired government employee who fought in courts for many years, against the employer-government which denied his legitimate claim for gratuity, the Supreme Court directed the state to pay it within three months. The bench comprising of Justice RK Agrawal and Justice AM Sapre, observed that the Gratuity Act, being a welfare legislation meant for the benefit of the employees, who serve their employer for a long time, it is the duty of the state to voluntarily pay the gratuity amount to the appellant rather than to force the employee to approach the court to get his genuine claim. It also imposed a cost of Rs. 25,000 on the state of Chhattisgarh for dragging the litigation. While allowing an appeal preferred by the Union of India against a high court order that had favoured a retired railway employee, the Supreme Court recommended the Department of Personnel and Training of the Government of India to try and make life after retirement easier for a government servant. A bench headed by Justice Madan B Lokur recommended that an appropriate legislation be enacted by Parliament or applicable Pension Rules rather than a ‘khichdi of Instructions, Office Memoranda, Clarifications, Corrigenda and so on and so forth’. The Supreme Court ordered the release of “Champion Sangma” from custody by allowing his habeas corpus petition. Champion Sangma is alleged to be the leader of the Garo National Liberation Army. According to an Indian Express report, Champion Sangma, whose real name is Pakchara R Sangma, is a postgraduate in philosophy from the Northeastern Hills University, Shillong. He was recruited to the Meghalaya Police Service as a DSP in 2004. But he remained on probation till 2009, until one day he disappeared. The Supreme Court, on Tuesday, observed that any harassment of an innocent citizen, irrespective of caste or religion, is against the guarantee of the Constitution and the Supreme Court must enforce such a guarantee. The Supreme Court restored the election petition challenging the election of Yuvajana Shramika Rythu Congress Party (YSRCP) MLA Peddireddigari Ramachandra Reddy, which was dismissed in limine by the High Court of Judicature at Hyderabad for Telangana and Andhra Pradesh. The Supreme Court, on Wednesday, summoned Maharashtra DGP Satish Mathur after being irked at the cluelessness of the officers present in Court when asked about their investigation into the manner in which the 68 girls rescued last year from a red light area in Maharashtra travelled to the State from Rajasthan. A two Judge Bench of the Supreme Court on Monday stayed the trial of Junaid Khan lynching case on a plea by his father Jalaludeen seeking CBI Investigation in the case. The Bench of Justices Kurian Joseph and Mohan Shantanagoudar has also issued notice to the State and CBI. In a 2013 PIL concerning the living conditions of the refugee Rohingya Muslims residing in makeshift camps in Delhi and Haryana, Rajasthan and Jammu and Kashmir the Supreme Court bench of Chief Justice Dipak Misra, Justice D. Y. Chandrachud and Justice A. M. Khanwilkar on Monday directed the respective governments to file a comprehensive status report “based on facts and proper site visits” within two weeks. The Supreme Court allowed AIIMS to discharge an infant born with congenital heart defects after noting that the child is fit for discharge, having been cured of pneumonia and with the parents yet to give consent for complex heart surgery, while directing the hospital that whenever the parents decide to consult a cardiac surgeon upon a referral from OPD, the same shall be done with “due sensitivity”. The Supreme Court made an observation that the structure of Debt Recovery Tribunals (DRTs) may need to revisit taking into account the suggestion for permanent cadre, autonomous selection procedure, autonomous accountability and disciplinary mechanism, finality subject only to the jurisdiction of constitutional courts, to uphold the rule of law and independence of the judiciary. 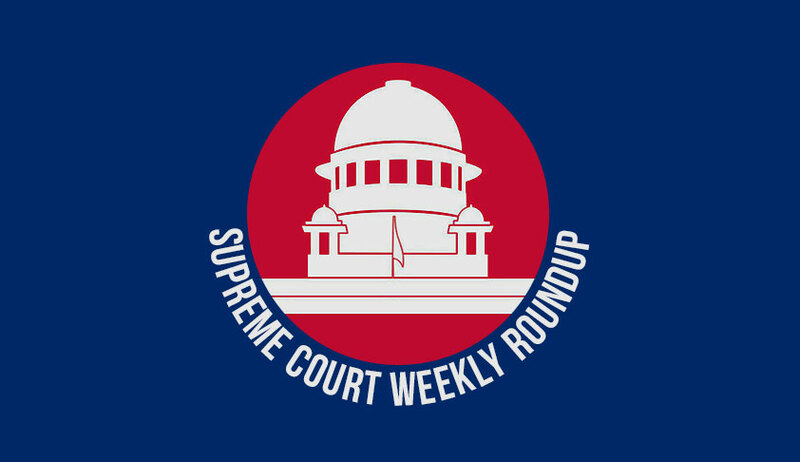 While dismissing a special leave petition filed by the State of Uttar Pradesh, the Supreme Court directed the Chief Secretary to issue appropriate directions to its Law Department for not filing frivolous matters before the apex court. The state had approached the apex court against an order of Allahabad High Court directing it to release the entire amount of post-retiral benefits to which the retired employee is entitled, including pensionary benefits, as well as the amount which has been allegedly deducted from his GPF. An advocate was on Thursday issued notice of contempt by the Supreme Court after she made derogatory remarks against the court and even dared it to take action against her when warned that her remarks amount to contempt. A bench of Justices A K Goel, Rohinton Fali Nariman and U U Lalit issued notice of contempt to advocate Nisha Priya Bhatia asking her to file an affidavit within two weeks explaining her conduct. The Supreme Court bench of Chief Justice Dipak Misra, Justice DY Chandrachud and Justice AM Khanwilkar on Friday issued notice in the SLP preferred by former IGP Zahur Haidar Zaidi against the January 19 order of the Himachal Pradesh High Court dismissing his bail plea in respect of the custodial death of an accused in the 2017 case of gangrape and murder of a minor schoolgirl in Shimla. Supreme Court on Friday directed Chief Secretaries of States to file an affidavit within two weeks explaining the steps taken to appoint a Lokayukta and also specify the reason for the delay. The Supreme Court, on Tuesday, directed all government authorities to ensure that the fee for a Right to Information (RTI) application does not exceed Rs. 50 and the fee for photocopying is not more than Rs. 5.